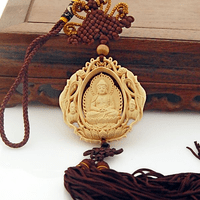 Lucky Amulet Car Decoration Amitabha Buddha Amulet in Car. This Good Luck Amitabha Buddha Car Decoration is handmade from Walnut wood. This car decoration amulet was carved with Amitabha buddha on the two sides. Buddha Pendant size: 52mm*50mm. Length: about 400mm. Amitabha Buddha is believed to bless people boin in the Chinese Dog and Pig years. Amitabha Buddha is the Buddha of Infinite Light, who reprents endless light, and longevity. Amitabha Buddha can help people boin in the Chinese Dog and Pig Zodiac years aviod disaster, obtain wisdom, get ride of worries, and to be longevous. So people boin in dog and pig years may wear Amitabha buddha amulet. . If you donot know your zodiac, Click Here to check your Chinese zodiac.